Rob Lomas has named his second, and typically simple, player Madi for his youngest daughter Madeline. It has a standard straight tone arm which has been lengthened to a pivot-to-stylus distance of some 38 centimeters and fitted with a straight shell. 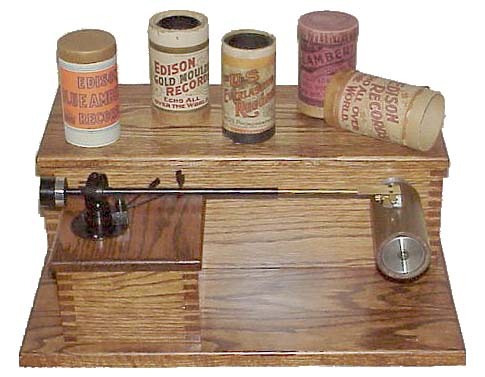 The cartridge is a Stanton 500 with a Lomas 76µ sapphire stylus that he uses for all kinds of cylinders, although 150µ styli are available as well. The mandrel is machined from solid aluminium to a tolerance better than 0.02 mm and press-fit onto the 12.5 mm shaft at 700 kilograms pressure. Thus the mandrel cannot be changed, so if you want to play larger size cylinders you would have to resort to slip-on mandrels. The tone arm can be raised to accomodate the larger cylinders. The belt drive with an asynchronous motor has four fixed speeds (160, 144, 120, 80 rpm) and variable speed as well. All switches are on the left side of the box the tone arm sits on. In the player there is a Lomas-designed preamplifier included, with a 220 Hz rumble filter that works at all times and a switchable low pass filter (3200 Hz, 18 dB rolloff) intended for playing cylinders for enjoyment. For transfer work, that filter can be bypassed to get the full signal. Rob Lomas says the arm has been tracking well on all types of cylinders (brown wax, black wax 2 and 4 minute, Lamberts, Blue Amberols etc. ), but that Indestructibles do not track well except at half speed. For badly misshapen cylinders, he recommends using his ACT unit, which has a very short, spring loaded tone arm and quicker reactions. Rumble from uneven or excentric cylinders seems to be more of a problem than with the ACT, but the noise from the drive mechanism that can easily be transmitted through the ACT's carrier eye does not appear in the Madi. If there is interest in the Madi player, Rob Lomas intends to sell a maximum of eight units, as he doesn't have parts for more. The price is US$ 595.